IBM® WebSphere® Service Registry and Repository (WSRR) provides service registry and repository functions for service-oriented architecture (SOA) enterprise applications. 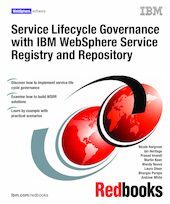 This IBM Redbooks® publication uses business scenarios to illustrate SOA governance using WSRR as the authoritative registry and repository. -- Part one of this book introduces SOA and service governance, provides a technical overview of WSRR, and describes the WSRR governance enablement profile. -- Part two of this book provides step-by-step guidance to building WSRR solutions. This part addresses topics such as modeling in WSRR Studio, creating a WSRR user interface, security, promotion, policies, and reports. -- Part three describes a series of common usage scenarios and describes step-by-step how to implement them in WSRR. These scenarios describe how to govern schemas, existing services, new services, upgrades to services, and business processes. This book is based on WebSphere Service Registry and Repository V6.3 and is intended for IT architects and IT specialists looking to get a better understanding of how to achieve service life cycle governance.